Ronan is the law enforcement chief of the alien race of the Kree. 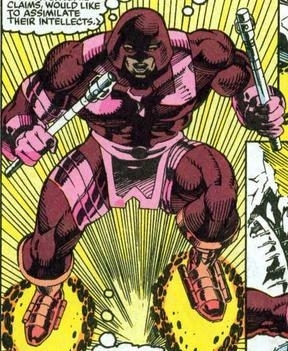 He is an interesting choice for antagonist in the Guardians of the Galaxy film as he has most recently been playing the part of a hero in the Marvel cosmic universe, fighting alongside our characters in such events as Annihilation, Annihlation: Conquest, War of Kings and, most recently, Infinity. His origins were on the antagonistic side, however, as he got his start when the Fantastic Four ran afoul of an ancient Kree Sentry on Earth. He was dispatched to handle the incident. The Kree were among the first visitor to Earth, millenia ago. Their scientists tweaked the genetic coding of several individuals, resulting in the birth of the Inhumans. The Inhumans eventually developed powers and were intended to be used by the Kree as an army. Needless to say, tensions between the Kree and the Inhumans are high. At one point an arranged marriage between Ronan and Inhuman Crystal (ex-wife of upcoming Avenger Quicksilver, by the way.) resulted in the pair falling in love. Sadly, it did not work out for them in the long run. The Kree and Ronan are definitly a clue as to the future of the Marvel Cinematic Universe. It looks as is Guardians is going to be pretty heavily invested in the Kree storyline. Korath is an operative of the Supreme Intelligence, ruler of the Kree. 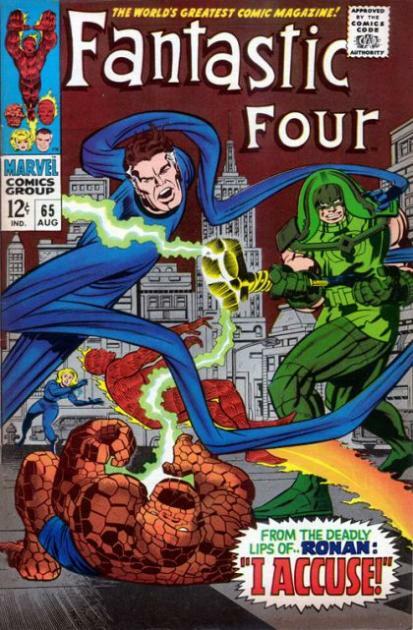 He's a relatively minor character who's faced off against the Avengers a handful of times in various cosmic stories. His inclusion in Guardians of the Galaxy is pretty impressive, and is hopefully indicative of the depth the film series will go into Marvel's ample cosmic catalogue. In the comics, he's more of a scientist than a fighter, but he does rely on his gadgets when it comes to combat. He's even got the sci-fi staple, rocket boots. Housou appears to be bringing the "persuer" aspect of Korath to the front in the media we've seen thus far. Another example of drawing from the well. Nebula's past is laregely a mystery. She first popped up as a space pirate of sorts, not unlike her supposed gradfather, Thanos. This would make her the sort-of aunt to Gamora, but it looks more like the film may be playing them off as sisters. She runs the gamut of traditional super powers. Super storng, tactical genius, hand to hand combat specialist. She's done a lot of the traditional villain things as well. Tried to conquer an alien race (failed), wielded the Infinity Gauntlet (lost it), and got burned half to death by her grandfather. Yeah, that's messed up. Thanos isn't a good guy. We should probably talk about him some more. Thanos. The Mad Titan. The Consort of Death. The grandaddy of them all. Since his debut in 1973 you'd be hard pressed to find a major cosmic event without Thanos' fingerprints on it somewhere. His reveal at the end of 2012's Avengers shocked a lot of people, myself included. Marvel has big plans for this character's future in the Cinematic Universe. But, what about his past? 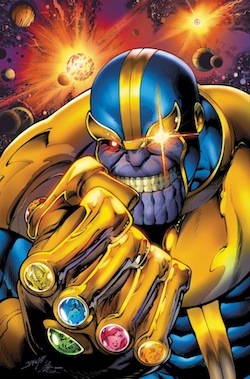 Thanos is from Titan, a moon of Saturn. As a youth, he was the stereotypical "weird kid." If he were on Earth, he'd be raising a lot of red flags by hurting small animals. Remember the post-credit scene in Avengers when Thanos smiled because his servant mentioned Death? That's because Thanos loves Death. Not the concept, which he's also quite fond of, but the embodiment of Death herself. He goes to great lenghts to please her. He killed all of his various children as a sacrfice, and took over his home world in her name. We'll get into the Infinity Guantlet in another post, but it's a constant goal of Thanos'. He's had it and lost it a few times, mainly due to his own grand hubris. He's a formidble foe even without the Gauntlet. Beyond his imposing stature and incredible strenght, he can synthesize cosmic power as a weapon. Also, he really doesn't stay dead. Death ressurects him. Good luck, Guardians. Next time: Items and places! The Collector! Who else might show up? Oh, and who's Nathan Fillion??? 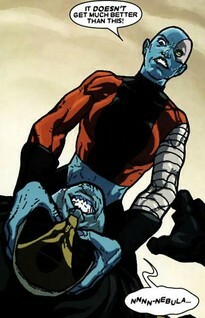 Nebula character which is portrayed by Karen Gillam on superiorpapers.com is nice. I think the sisters have that the ability to fight with that alien. And that guy you are right it probably is not good for both the sisters but in the end, they have to cop up with the situation the only solution is that.